Looks in to us. 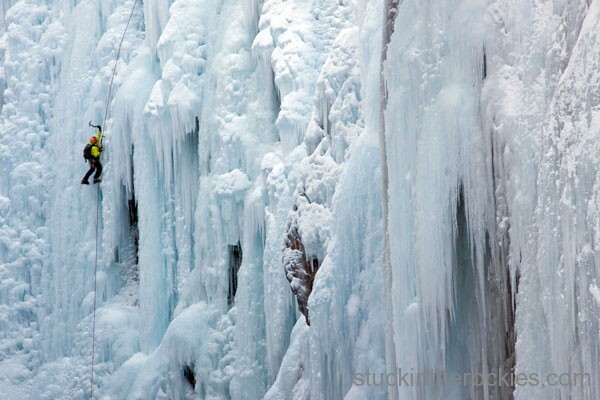 A climber ascends the ice near the Upper Bridge. 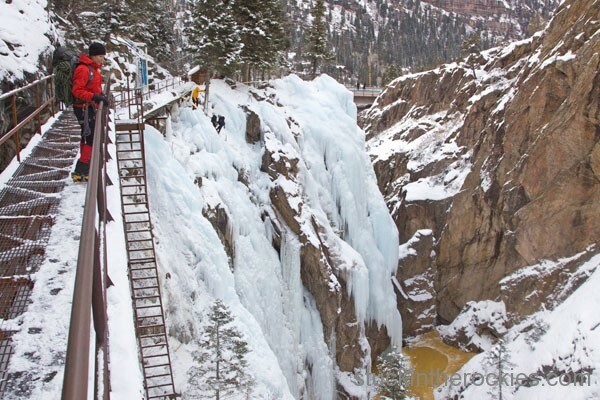 “The park is 100% open!” reads the sign at the Upper Bridge of the Ouray Ice Park. It was an interesting announcement because by January I figured it’s always completely open, but just a couple of weeks earlier things weren’t so certain. 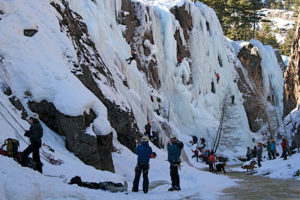 This past weekend was our annual escape to Ouray. 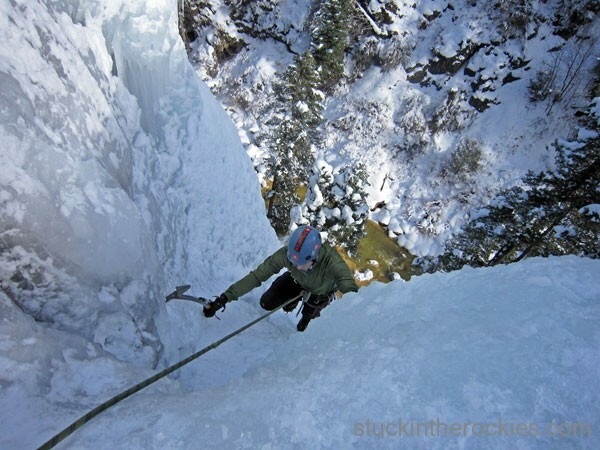 A tradition for some half a dozen years, Christy and I (and whoever we can rope into coming along) leave Aspen and the ski scene, and make our way down south for a little ice climbing. As a sort of post-holiday/midwinter change of scenery, we count on the extended weekend getaway to unwind. 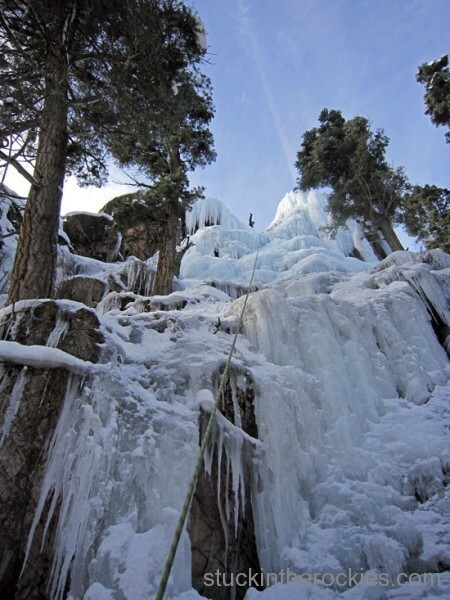 We always assume that by midwinter the conditions in the park will be conducive to ice formation and climbing, but recent events show that we shouldn’t take it for granted. 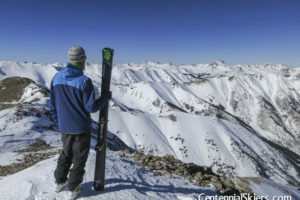 As it happened this year, the warm temperatures that accompanied the big storm cycle around Christmas, which brought rain to Aspen for two days straight, wreaked havoc on the park, forcing it to close just two days after it opened for the season. Read a report here. Christy, just happy to be here. 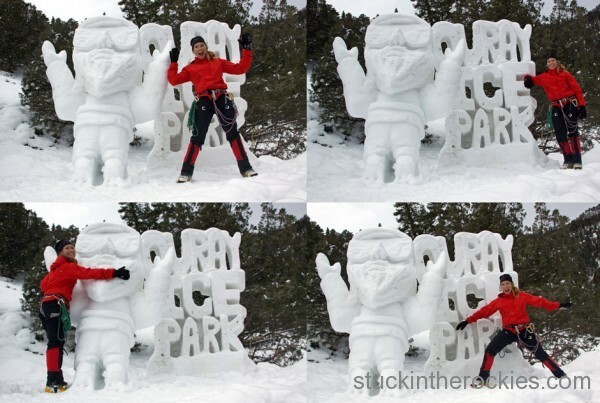 Luckily, father winter returned and they were able to get back to building ice, just in time for the 16th Annual Ice Festival, and for our arrival the following weekend. 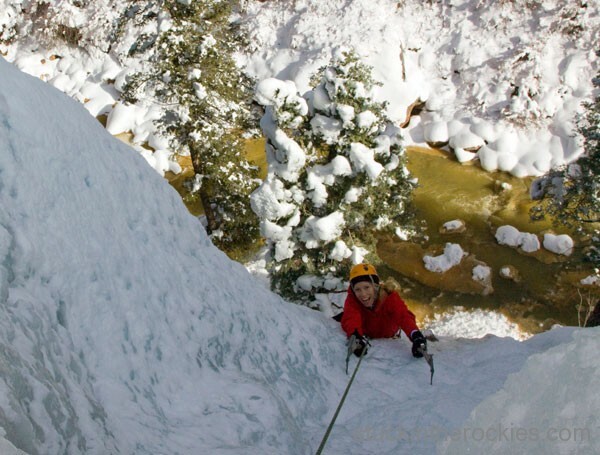 While some routes were a little on the thin side, it’s completely open and as fun as ever. Big thanks to the guys who got things back on track. We had a blast, as always. Because it’s free all the time, and considering the effort put in by those behind the scenes, anyone who climbs in the park should buy an annual membership. The $40 fee is a mere pittance when compared to what is offered and it’s the least we can do to help keep this awesome outdoor amenity going and to support all the hard work of the staff this season. The Schoolroom/ Alcove area is in, just watch the water level of the creek below, which was pretty high through the whole weekend. 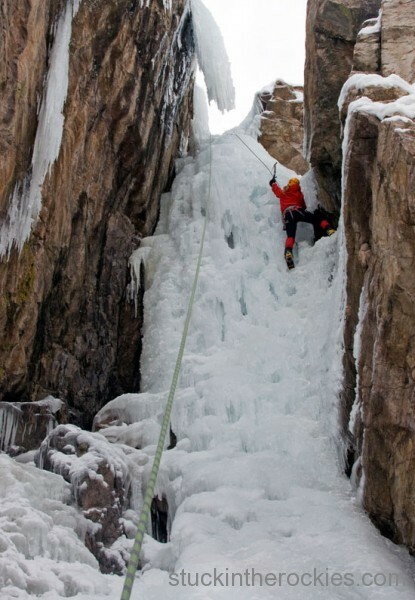 Ascending a route in the “Scottish Gullies” area. Waving Christy up, looking pretty fat, actually. Feeling rather pumped, here on “Ach Mon”, her 9th climb of the day. 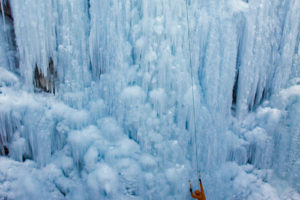 A slideshow, some ice climbing in Lake City, and and our first peak ski attempt of the season.